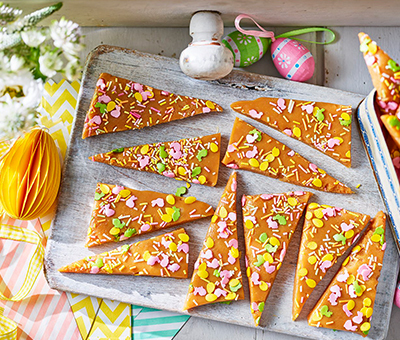 In 3 easy steps create this delicious Easter recipe perfect to make with the whole family. These scrumptious triangles also make a great gift for your loved ones. Place all the ingredients except the sprinkles and sugar decorations into a large non-stick saucepan and melt over a low heat, stirring until the sugar dissolves. Bring to the boil then simmer for 10-15 minutes, stirring continuously and scraping the base of the pan. Take care while the mixture boils and during stirring as the fudge will be VERY hot! To see if it’s ready, drop a little of the mixture into a jug of ice-cold water. A soft ball of toffee should form. Alternatively, check with a sugar thermometer if you have one (the toffee should be approximately 113°C). Pour into the prepared tin and whilst still warm top with the sprinkles and sugar decorations. Place in the fridge to set before cutting into triangles. Our Butter Toffee is a great gift for any occasion… Look out for different sugar decorations for Christmas! Keep in an airtight container for 2-3 weeks.